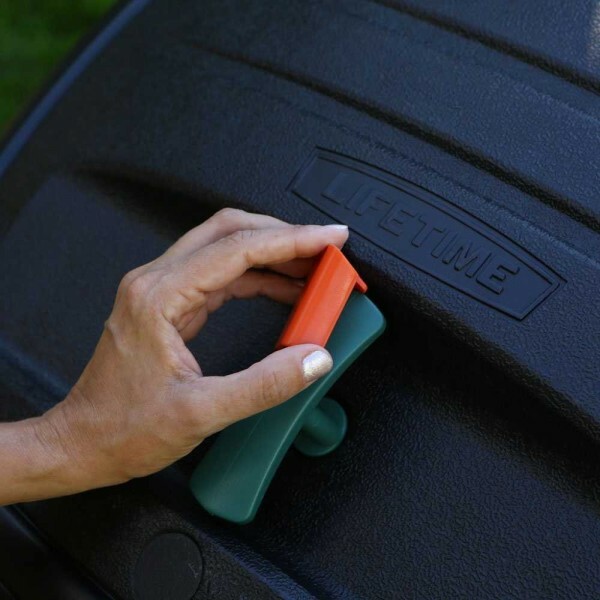 Cut composting time in half with the Lifetime Dual Composter. 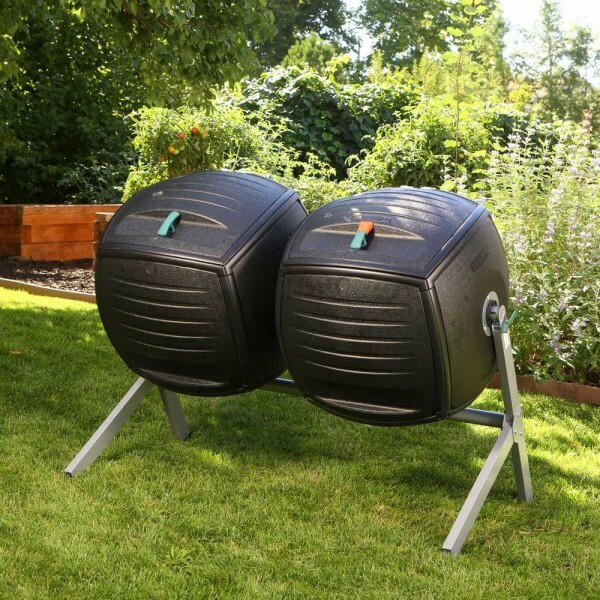 This dual composter features two 50 gallon tumblers which allow for continuous composting. Now you can let the batch of compost in the first tumbler process while you add fresh ingredients to the batch in your second tumbler. 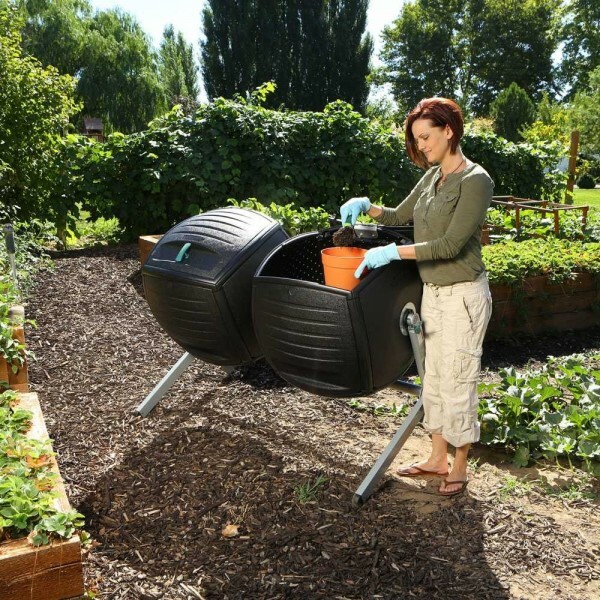 Take advantage of a more efficient method of composting with the Lifetime Dual Composter. The dual tumbler design means you don't have to wait for your first batch of compost to finish cooking before you start on another one. This can eliminate weeks of waiting! Each 50 gallon tumbler is constructed of black double-walled polyethylene plastic to absorb heat and an internal aeration bar to create the necessary airflow needed to break down the compost ingredients. Four small vents are designed into each corner of the tumbler to provide additional airflow. The non-cylindrical design of the tumblers allows for more effective mixing of contents when rotated. 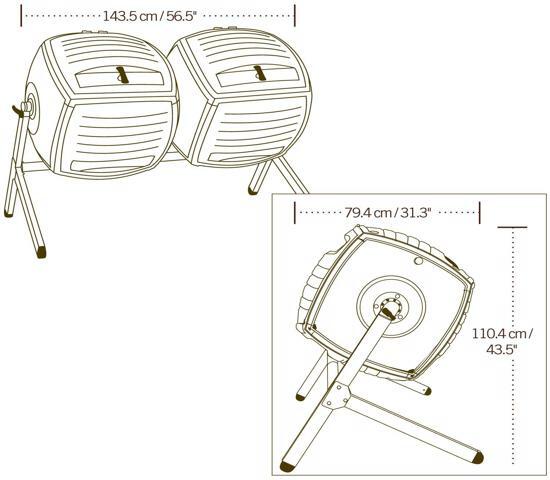 The tumblers are set side-by-side on a sturdy steel base and can be easily turned on its axis for compost rotation. Use the red processing indicator clip to attach to the handle of the tumbler so you can keep track of which batch is cooking and which batch you can add fresh ingredients to. With the enclosed tumbler design you can speed up compost processing time and avoid the smelly, unsightly mess of an open compost heap. Save money on expensive fertilizers by creating your own rich, fresh compost for your vegetable and flower gardens. This product does not contain BPA. For more information on composting including what kinds of materials should and should not be composted, read our Garden Composting article as well as our How To Compost instructions. For more information about assembly, read the Owner's Manual Sample. New and improved Lifetime 65 gal. 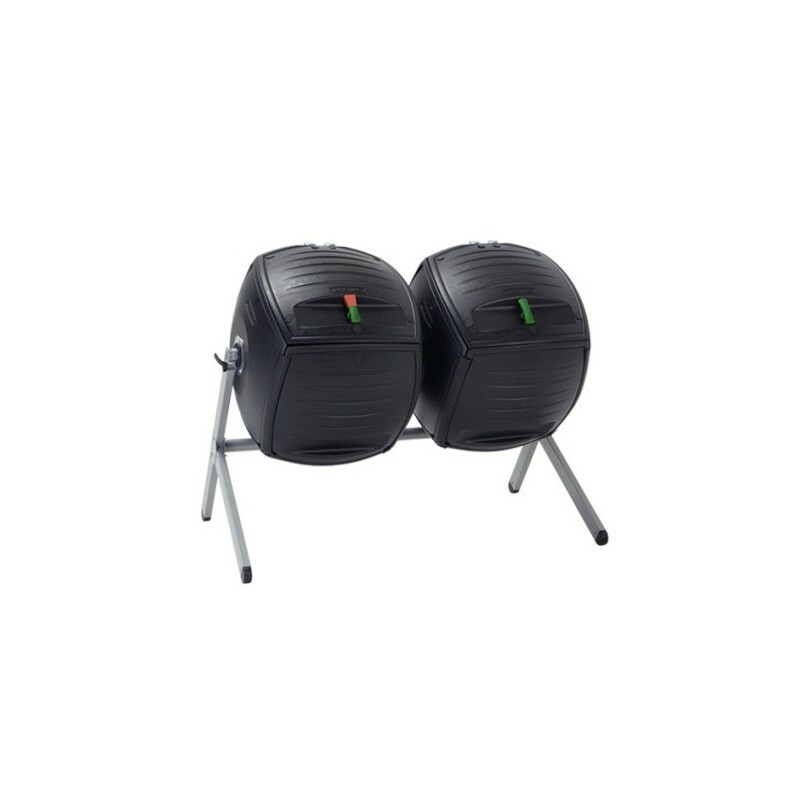 composter is designed with a larger aeration tube to speed up the cooking time of your compost. Constructed from heavy-duty polyethylene plastic with a sturdy metal frame and extra-large removable lid for easy filling and dumping.FREE Fast Shipping! 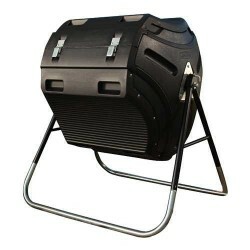 The Lifetime 50 gallon garden composter is designed with a black double-walled polyethylene plastic tumbler set onto a galvanized steel frame. Internal aeration bar provides airflow and aids in mixing contents. Save money on expensive fertilizers by making your own compost from organic kitchen peelings and yard clippings. FREE Fast Shipping! 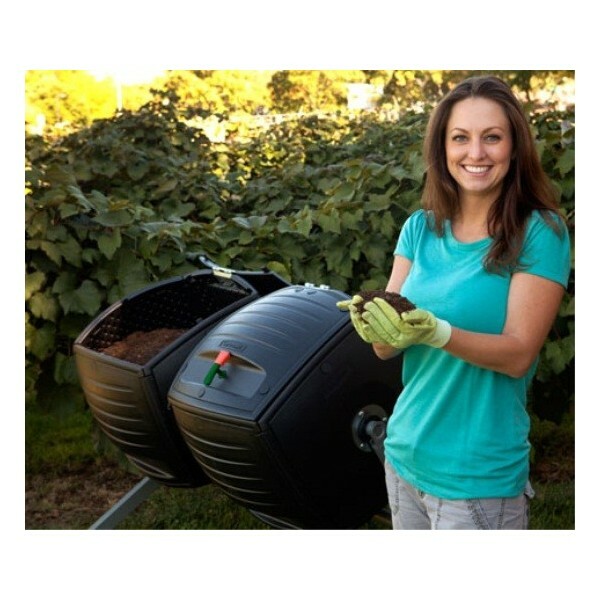 Create your own nourishing organic soil in your vegetable garden and flowerbeds with a Lifetime Composter. 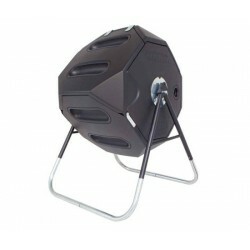 Constructed of lightweight black polyethylene plastic with a galvanized steel base. 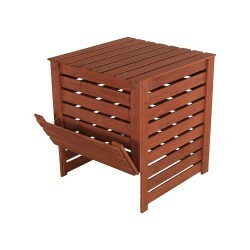 Designed with an extra large removable lid for easy access for loading and dumping. Composting DVD included!FREE Fast Shipping! 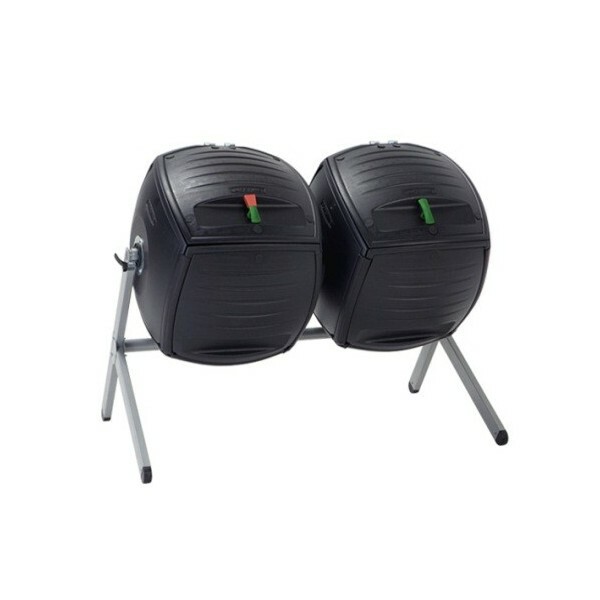 Easy to use compost bin with natural aeration system, cover and pullout door. 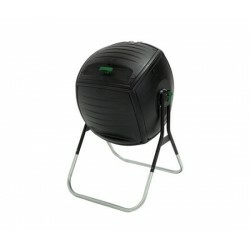 Easy to use compost bin with built-in aeration system. Comes with cover. Pullout door provides easy access.FREE Fast Shipping!